I was counting the layers of my clothing, while waiting for friend Peter to collect me for some long awaited trout fishing at Meon Springs this week. The forecast had been dry two days before, but now those isobars were shifting and the temperature was down to 5 C, with blustery showers due at lunchtime, so for me it was thermals, a woolly shirt, polo shirt and a dense hoody beneath my quilted fishing waistcoat, with a wax cotton jacket to follow, if things got really bad. In contrast Peter looked his usual dapper self in moleskin trousers and checked cotton shirt, assuring me that he would be perfectly warm in his thin waterproofs. As we drove down into the Meon Valley, the morning mist was lifting and the lake was bathed in golden sunlight to welcome us; it looked like Peter’s clothing choice was the right one. Tackling up on the clubhouse verandah, we could see the lake was like glass, without a ripple down to the dam and were going to be the first to break it’s surface that morning. 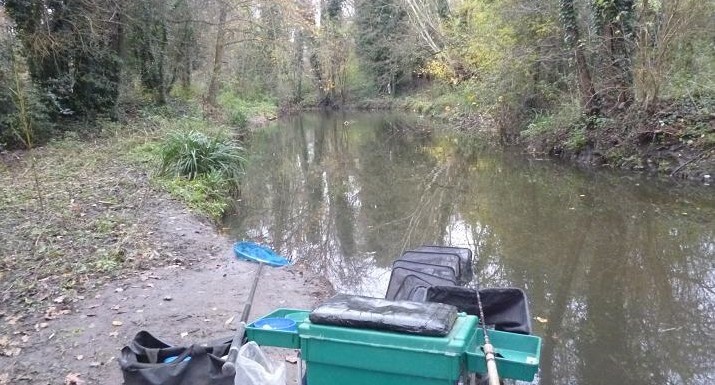 Our previous visits had seen us both get our two fish limit within the opening twenty minutes and on this occasion took our time to drink coffee, followed by a stroll along the banks before fishing. Plenty of rainbows were visible in the crystal clear, chalk fed waters, although most seemed stationary, not searching for food. Peter started off with his current fovourite method, an Orange Blob on a leader greased to within two feet of the lure, fished static, while I began with a bloodworm fished two feet beneath a floss indicator, the method that had proved successful at Meon Springs before. We were both casting to seen fish and the feeling of panic was beginning to set in after twenty minutes of twitching the fly to no response. I broke first, tying on a Blue Flash Damsel lure, which I retrieved with a slow figure of eight. At least now I could see fish move towards it and follow, but they were just plucking at the tail, or lightly holding it. A left hand pull made contact a few times, but it took another ten minutes, before the line held long enough for the rod to set the hook firmly into a fish. At last! A two pound rainbow exploded on the surface, then began the head shaking fight associated with a lightly hooked fish, but it stayed on and was soon on the bank. 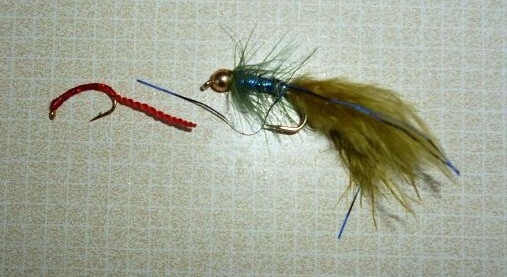 A typical stockie, that fought well on my 9 ft 6 in Greys 7/8 rod, the BFD just in the front of the bottom lip. This was the first outing with this rod, bequeathed to me by Peter, as compensation for accidentally shutting my 30 year old hand built rod in the boot lid of his car last time out. I must say this piece of modern technology was a joy to use, light weight and powerful, an improvement over my old Normark blank. Maybe it’s time to start looking at a new fly line? Mind you the current one, a Cortland bought at the factory in New York state, has permanent kinks, that give an early warning of a take, when they straighten. The Blob was now gone from Peter’s leader, to be replaced by a bloodworm on a very slow retrieve and an instant take resulted in a lost fly. Tying on another, he was soon playing his first rainbow of the morning, a 2 lb fish. Frustrated by the will they, won’t they takes on the Damsel, I too decided to give the bloodworm another go, still tying on the fly, when Peter landed a 2 lb 8 oz rainbow minutes after the first. By now a cold wind had picked up, driving those predicted showers down the valley and Peter retreated to the comfort of the clubhouse to warm up, leaving me to battle the elements. The bloodworm worked with plenty of short takes, but having suffered two dropped trout, I went back to the BFD and was rewarded with a slightly fatter fish. With my two fish in the fridge, I sat down with a hot drink and a sandwich by the club’s log fire, while Peter walked down to the catch and release lake for some more punishment, where I met up with him 30 minutes later. 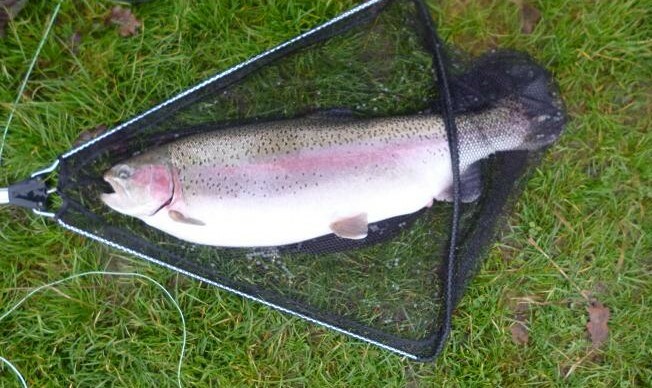 In that time he’d put two very nice fish on the bank, an estimated 7 lb rainbow and 2lb brown trout in good condition. Using only barbless hooks on this lake, the fish were returned with the minimum of damage, both having taken the bloodworm. Another angler joined us shortly after, fishing the deep water by the dam and hooking into another monster rainbow, struggling to get the fish in the net, but finally managing to get the barrel shaped brood fish on the bank. 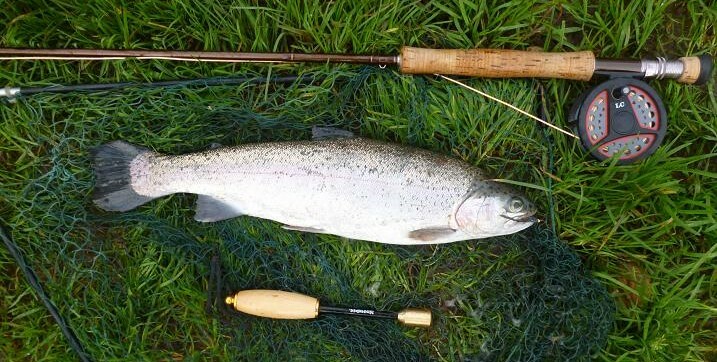 This tank of a rainbow weighed 7 lb 4oz and was full of eggs, spraying them all over the grass, when lifted back into the water. 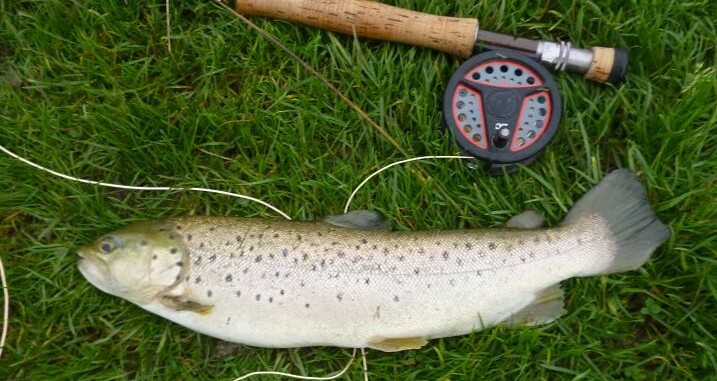 As the weather worsened, with icy rain now lashing down, it was up to me to follow the Lord Mayor’s Show, when my Blue Flash Damsel was taken by a very ragged looking brown trout, netting this fish as soon as I could, before beating a retreat back to the dry haven of the fishing lodge. In just three hours, the changeable English weather had transformed this quiet part of Hampshire and we were happy to leave the lake to the stewardship of the swans. Stickfloat perch brightens a dull winter’s day. A planned autumn visit, before the leaves dropped, to my small local river, was thwarted by constant rain and flooding, that saw surging brown water covering the banks for over a week, but as the temperature fell, so did the water level and I arrived on the 1st December to find a pacey, clear stream running within it’s banks. Those banks were covered in mud, as I carefully picked my way through to my chosen swim, a weak midday sun fighting a losing battle with grey scudding clouds. With a busy town road one side and a crowded housing estate on the other, this is a ribbon of wilderness among an urban sprawl. Upstream gravel shallows channel the flow along the opposite bank, where I expected to find a few chub to start the session and threw a couple of squeezed balls of liquidised bread beneath the tree roots in anticipation of the next few hours fishing. The river here is only 30 inches deep and a light approach is required, setting up my 12 foot Hardy Match rod with a 3 No. 4 Middy Ali stickfloat on 2.6 lb line to a size 16 barbless hook on a 2 lb link. 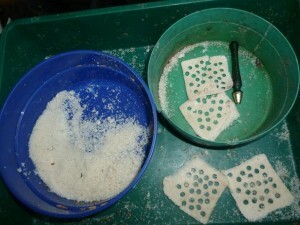 Bait was a 5 mm pellet of punched bread. First cast in, the float never settled, sliding off towards the bank, before sinking from view. I braced and swept the rod back upstream, watching the rod bend in an arc to the pull of a fish. A flash of silver deep in the river said roach, not chub, the steady pounding of the roach, not the hoped for explosive run of a chub. A solid healthy roach nonetheless and a good start to the session, which was repeated on every put in for the next twenty minutes. I tried another ball of bread further downstream towards an overhanging branch and cast to follow it down. The float sped away downstream, a firm strike and bang, solid resistance. A chub? At first I thought it was, as the fish made a beeline for the the snag in a straight line run, before turning across the river, then dashing back, hugging the far bank, boring deep. Getting the landing net ready, when it drew near, I lifted the rod to see, not the big white mouth of a chub, but the bright red fins and deep body of a decent rudd. 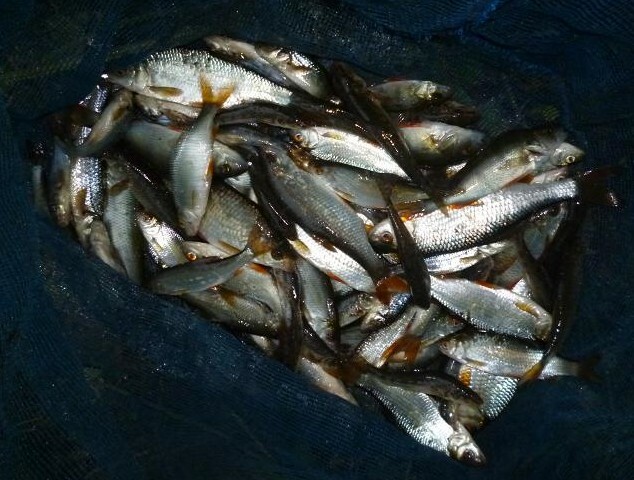 I now settled into a steady rhythm of fish catching, the bread punch selecting smaller roach, the occasional rudd, or skimmer bream and gudgeon, including some clonkers. 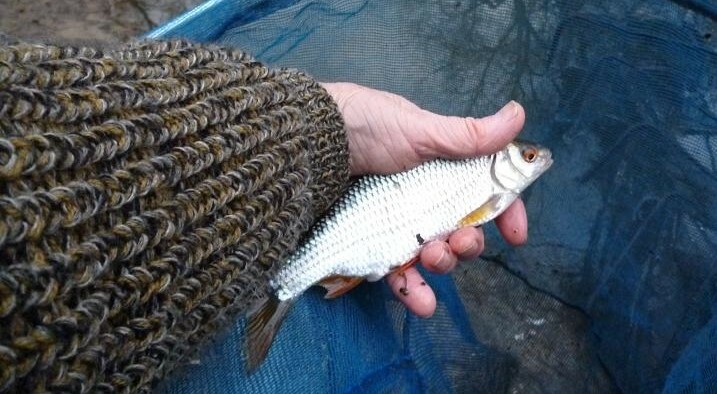 Bringing a small roach back along the far bank, there was a swirl and as I lifted the roach clear, the pale green, striped back of a big perch broke the surface. The bread had attracted more than just small fish and next cast I hooked a small gudgeon, drawing it slowly back, dabbling it on the surface to tempt the predator. Like a ghost, the perch came up behind the offering, hovered and took. I gave slack line, as the gudgeon was seized, only for the small fish to appear on the surface again, rejected. 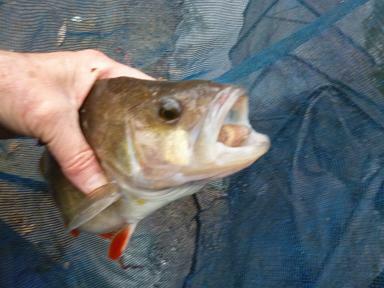 I reeled in a foot of line and the perch was back with avengeance, this time turning, taking line downstream. A count of ten and I lifted the rod to meet the full force of a fish determined to escape. I can’t recount the time that it took to beat it, countering run after run in the shallow water, waiting for the gudgeon to be spat out at any time. Eventually it made a long run upstream, but ended up wallowing in the gravelly shallows and I drew it back on the surface into the net. Phew! Made it. 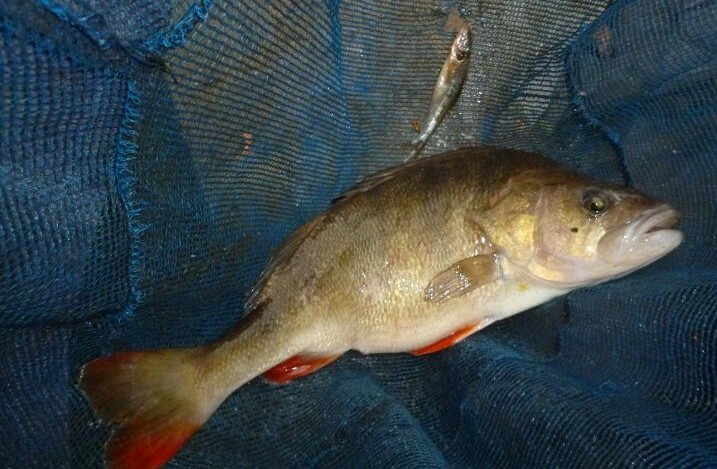 How many perch have I lost in the past at the lip of the landing net? Lifting the perch out of the net, the gudgeon was clearly visible, the tiny hook holding the bigger fish, having passed through the gudgeon’s lip into the edge of the gaping mouth. 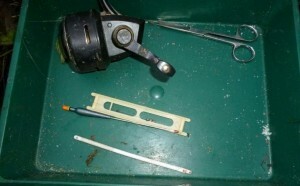 Removing the hook from the perch, the gudgeon was lifted out alive and swam off, when released. Not wanting the aggressive predator in my keepnet, that too was returned to the shallows, where it remained for a minute, or two, then was gone in a puff of mud. At 15 inches long, I estimated it’s weight to be around two pounds, but this being my biggest perch ever, I remembered after I’d released it, that I had my lightweight scales with me and could have recorded an accurate figure. All the same, it was an impressive fish to land on such a small hook. A sit down with a hot cup of tea from my flask was needed, before sorting myself out to continue. Looking in my bait tray, over a hundred pellets of bread had been made, each one a fish in the preceding two and a half hours. With perch in mind, I now switched baits to red worm and brandlings from my home compost heap, hoping for a few more stripeys, before the light went, but first trot down was another big gudgeon. Casting back in with the same worm, the float gave a couple of dips, then buried. Again not a perch, but a hard fighting roach, the change of bait must have shocked this one into taking. Perch did take the worms, but none more than a few ounces, enough to put a bend in the rod all the same, each cast taking pot luck on the species hooked. By 3 pm, the light was fading fast and I called a halt to my fishing, finishing my last cup of tea, while reflecting on a rewarding few hours spent on a truly urban river, bypassed by most local anglers heading out of town to fish. Constant action helped keep out the cold, putting over six pounds on the scales, which was a good result without the bonus monster perch.